TOKAI OPTICAL CO.,LTD. : Product : The Secrets of the "Neuro Science Lens"
HOME >> Product >> The Secrets of the "Neuro Science Lens"
WHAT IS "Neuro Science Lens"? The human feeling is very subjective and vague. By analyzing the brain waves when worn we have changed comfortableness to a objective countable matter. We have designed many progressive lens based on this indicator. The series is called the "Neuroscience lens." Come experience the "Neuroscience lens" and the feel the comfortableness to the brain through a optician or optical shop. Here on we will introduce the voice of the developers who came up and worked on the idea to adapt the "Neuroscience" to eyeglass lenses. 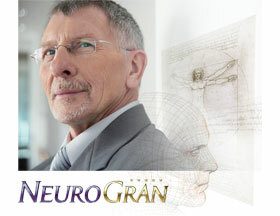 ■ Why did you think of applying the "Neuroscience" to a lens design? The wearers of progressive lenses always explained their frustration, against things looking distorted and that they felt dizzy after wearing the progressive lens for a long time. We at TOKAI thought back to the origin, what it means for the lens to be " good to use and comfortable to use." That is why we chose the "Neuroscience." It is said that human beings look with the brain, not the eyes. That was the answer. We thought that if the brain feels the lens "good to use and comfortable to use" it would be the answer to the frustration. ■ What was difficult about developing the lens? Progressive lens are complex lens designs designed to "look at far objects at the upper partial of the lens, and gradually close in the distance of vision to the intermediate to the bottom partial of the lens." So, the lens will have parts where it can be really hard to see. The biggest challenge is how much we can process these partials so that it does not bother the wearer, and widen the parts that is comfortable to see. Eliminating the part that is hard to see is impossible do to the changing of the power on the lens design. We got the idea to design this partial, hard to see so that the it does is unrecognizable by the brain. According to this idea, we repeatedly made proto types and measured the brainwave of the wearer to consider the effect on the brain. By trying many times we were able to understand the cause of the frustration and comfortableness and than, quantified it. In doing so we were able to pursue the details of the design even more than ever. The result was the birth of the "Neuroscience lens." It became easier to see the PC screen. Progressive lenses normally have claims that it is hard to get used to. 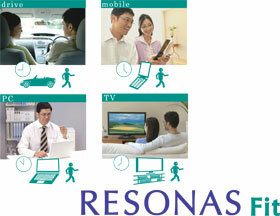 Although the RESONAS has a little claims from consumer so it is helping a lot. 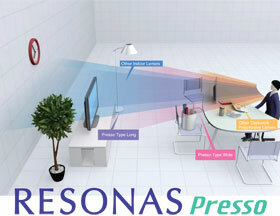 RESONAS is accepted from customers who had problems with progressive lens with its smoothness. 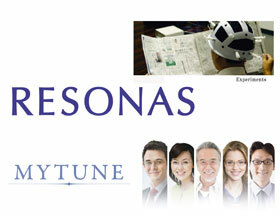 RESONAS has pleased even the customers that were unable to use a standard design progressive lens. I recommended RESONAS Fit for customers who are wearing glasses indoor mainly. They said that their feeling of the far view is as same as conventional type, but middle and near is more clear and wider than conventional type. We are selling RESONAS Fit confidently due to that there is no changing problem from other manufacture's progressive lens. The individual design makes wearing a progressive lens, stress free as of such of an single vision lens by taking full use of the design. 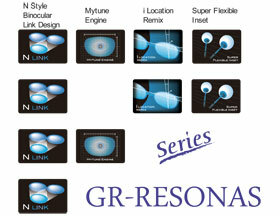 The GR-RESONAS reached this natural vision by using the latest neuroscience technologies enhance the binocular vision. A near-intermediate progressive lens focused on “Near” vision.